Viewing topic "Cubase 5 and mLAN"
I am confused. While Cubase 4.5.2 had no problem recognizing my MOTIFXS8 and N12 mixer according to the mLAN Graphic Patch bay, CUBASE 5 ignores my XS8 and N12 totally. Do I need a new mLAN driver for communication with Cubase 5? The special Steinberg/Yamaha driver is still not available? Did I forgot something to set after installing Cubase 5.
you have to install a driver update for your N-12. Cubase 5 is programmed with Unicode, and the “old” N-12 driver does not support this. The new driver does. I’m not sure if Yamaha has allready put the new driver on there download pages. and think different linux user dont need support they need infos. to route the adat in outs directly to the 8in outs. to use as real adat interface. you can add also this in the firmware by pressing a button combination. if yamaha sleeps to long mlan will dye in the future of bad support from yamaha for me. and please dont tell me in times of programming firmware its for me necassary to buy all your new products with the future future mlanprotokoll xxxx. yes yamaha you have one off the best standards but it will never grow how you this support. if its not easy plug and play. so you sleeping thats all your products that dont work together. so solve this probleme now not next week. ok i know you will solve it but this time please fast. I do not think it has something to do with mLAN or N12 drivers. It is the Steinberg extension software 1.4.1 which seems not to work with Cubase 5. Even when I transfer a CPR file made with Cubase 4.5.2 it says that the MOTIFXS8 cannot be recognized or something like that. 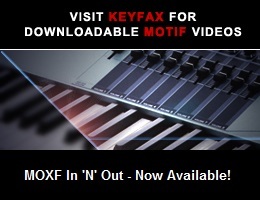 You do not find the ports etc named as MOTIFXS or N12. Also the N12 cannot see Cubase 5 so remote via N12 does not work either. I am almost sure I need another Steinberg extension software than 1.4.1? Bad Mister, what do you think? There will be new Yamaha Extensions for Steinberg DAWs for the n12, Motif XS, and Motif-Rack XS so that the Templates will show up when you start a New Project, the Motif XS ports will be identified by name and you will also get the n12’s VST CONNECTION audio ports identified by name… These Yamaha Extensions for Steinberg are written so that when you connect a Yamaha product to Steinberg software, it translates items like the ports (MIDI and Audio) so that they are identified by name, it allows you to IMPORT Motif XS SONG data from an ALL data file, it automatically alerts you when your mixer (n-Series) is Cubase Ready!, allows you to use the CLICK LEVEL function and other convenient functions for each Yamaha product that you connect. In the coming days, there will also be a firmware update for the n12 (v1.03)… A firmware update is quite a bit more serious and quite a bit different from the “extensions” mentioned above. Firmware updates change the operating system of your hardware. The next firmware update for the n-Series is NOT for everyone...please read the documentation CAREFULLY before you proceed with the n12 firmware update. (Of course, you should read all documentation that concerns firmware updates carefully… but in this instance you definitely want to understand what is on offer. Because it is not a firmware update that everyone should automatically do… it will depend on how you are using your n12). This firmware update is only for use with the new Yamaha Steinberg Firewire driver… not if you want to continue to use the existing mLAN driver v1.6.3. I send you this because I encounter so many users that simply go to the download page and download and install everything (without reading what it is they are downloading)… If you are one of those types and you are reading this, please don’t ignore the information provided with anything you download… It can sometimes be very, very important. Thanks for your answer. I suspected it more or less that it had something to do with that YSFW driver. No, I am not going to work with those 01x, or Mlan16E etc. kind of devices. Just the XS8 and N12 and maybe in future one of those new steinberg hardware. It would be nice when they hurry up with this new Yamaha Steinberg extension driver, having Cubase 5 already installed. It would be nice to to have all the benefits of Cubase 5 now. Ofcourse I still can proceed with my present Cubase 4.5.2. Still. Maybe Yamaha could put this Yamaha Steinberg driver on yamaha softsynt site. Would be a nice gesture. Hopefully, they will be posted shortly. Yes, we maybe are crazy and mad, but we europeans love the motifXS, N12 mixer, mLAN and Cubase. Its not my fault that Steinberg delivered this Cubase 5 that quickly in the Netherlands. Ofcourse I ordered it, but did not expect the package for month’s. Hahahaha. It would be nice when Yamaha keeps Up with Steinberg and delivers that Steinberg Firewire driver thingy. LOL. Yes, You cannot blame them. Still your answer that the Yamaha Steinberg Firewire Driver is up and available is confusing me. I thought that fire wire driver was just to accomodate the MR816 series? and only for Cuase AI4? Not for Cubase 5? and the XS + N12. I do not think that driver solves my problem of recognizing my XS and N12 in Cubase 5 with their names etc. That will be the new Yamaha Extension driver for Steinberg DAW? Right? I been reading this thread with interest, and I was wondering Jan where and how you got ahold of your copy of Cubase 5, I am thinking of preordering mine at Zzounds, and they expecting to be shipping it on February 18th. Interesting they ship early in Europe. What still had me on hold was the upcoming VST editor and the possibilities that it would bring to the freebie AI version, but man, after getting myself educated on the new Cubase 5 version, the new features are just to much for me to pass on, as much of a penny pincher that I am lol! and all the other amenities, but the above are whats important for my to be DAW rig, with Cubase 5 being fully 64 Bit compatible and with the soon to be released Yamaha 64 Bit firewire driver, this rig should be pretty sweet. I just got around to installing all my applications, drivers etc, to my surprise this Vista 64 is very very stable ( and fast! ) and all my accessories, printers etc are running perfect. I am also considering the N12, so this and other related threads are on my Motifator folder of bookmarks. I ordered it directly using the promotion email from Steinberg onwhich you could place your pre-order. Ofcourse as a registered user of Cubase 4, I receive this kind of promotion emails automatically. Thats easy to predict. Perfect software does not exist. Afterall making software is done by humans.